"The KZN Midlands is renowned for trout fishing..."
Local is lekker - and remember eating fish with a clear conscience is responsible behaviour and makes for a relaxed, indigestion-free meal! Always think green listed. It's the recommended fish from the Sassi (Southern Africa's Sustainable Seafood Initiative) list and is fish sourced from the healthiest and most well-managed populations. Find out more on www.wwf.org.za/sassi. I challenge you to make a difference. The KZN Midlands is renowned for trout fishing but there are noticeably few interesting, home-cooked combinations on dining room tables. Today we'll look at some simple ideas and tantalising combinations that are quick and easy to whip up at home. Try them - you will be pleasantly surprised. Let us start off with the most common way of cooking a whole trout. Braaing or oven roasting trout - the cavity filled with fresh herbs and flavouring - makes a relaxed meal for a lazy day at the pool or the dam. Ideas don't have to be off the wall to be impressive. The slightest ingredient changes can make all the difference. 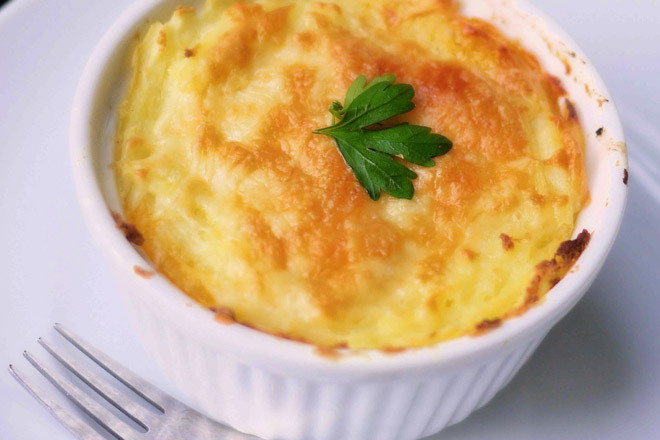 Think creamy-trout cottage pie for a variation of the traditional minced-meat cottage pie. This promises to be an interesting alternative to your normal weekly meals. Serve with a freshly-picked leafy, green salad drizzled with butter-lemon dressing; crunchy, sage leaves and a warm, crisp seed selection. This is healthy - and delicious. Trout spring rolls are a tasty variation to a theme. I'm a spring-roll fanatic yet so often I feel short changed because the centres are almost empty of ingredients. When making trout spring rolls ensure you are generous with the filling. I always serve them with home-made sweet chilli sauce. Trout rice salad is a refreshing and scrumptious light-lunch option. The slight spiciness with a touch of sweetness from the raisins complements the trout so well. Remember to include a side serving of lemon wedges. 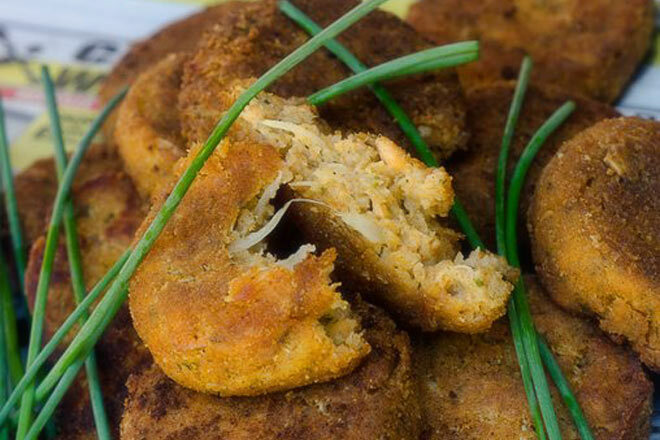 I struggle to find a good home-made fish cake. The key word is 'home-made'; I will never ever eat those terrible processed fish cakes - so I have to make my own. Serve as a starter with thick garlic mayonnaise or, more traditionally, with silky-smooth potato crème and mushy peas. When I started at Hartford House trout quiche - with rich, flaky fennel-butter pastry - featured as a side dish to a fish main course. How food has changed over the years! Although culinary trends may have evolved nothing beats a quiche made with love and care. This dish screams savoury richness. Stir fries take me back to my junior school days. I had a friend, Bryan, and his parents organised a make-your-own-stir-fry birthday party! I was in my element! It was a very novel idea considering there were no cooking shows or Master Chef competitions in those days. Bowls of vegetables, meat, fish, seeds, oil and soya surrounded us and we were all encouraged compile then cook our own stir fries. So clever because children, generally, have different preferences. We all had a blast! And now when I think stir fry, I step back in time to a very happy place. 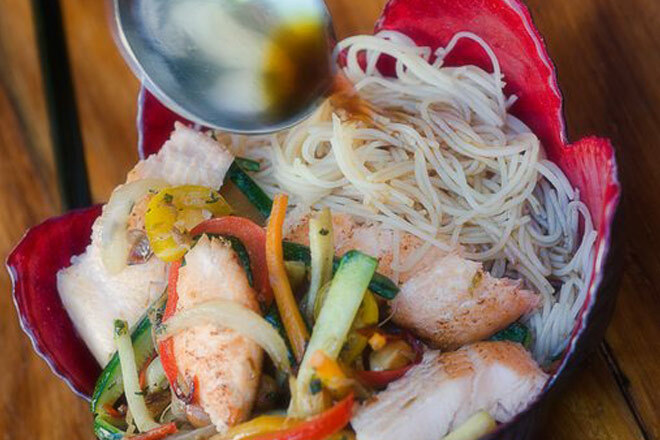 This trout stir-fry recipe, using combinations you can find in your pantry, is tasty, quick and easy. I wish you happy cooking with one of our local and best fish - the trusty trout. I am putting the final touches to 'Jackie Cameron Cooks At Home'. Keep a look out for this user-friendly recipe book. It will be on the shelves in April 2013. Contact Sue on 082 415 3780. GO TO : youtube.com/watch?v=dqyBGtP6rDs FOR A YOUTUBE VIDEO OF ME COOKING TROUT!